Summer is still here, with its long days and warm nights, beckoning riders out to the barn and into the ring. But along with the fun that the season brings, there’s a little pest that we all have to contend with: flies. Of all the buggy irritations out there, gnats have to be one of the most maddening. They linger around your horse’s ears, making him toss his head, and making you mumble those choice things under your breath. The Cashel Comfort Ears are a perfect solution in preventing and eliminating such aggravations. The Cashel Comforts Ears, made of a soft, breathable jersey nylon material, fit over your horse’s ears and under the bridle. The light weight material, the same used in Cashel’s Crusader Fly Masks, allows your horse to move his ears with ease and has a “forelock freedom feature,” as Juls, our Sr. Sales Manager, would describe it. 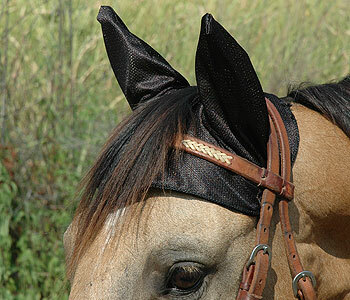 Or try the Fly Armor Browbands , a new product this year. The browband attaches to each side of your headstall using a Velcro closure and contains two citronella scented strips that slip into perforated pockets. The all-natural repellent strips create an invisible “force field” of protection for your horse against flies. Depending on the heat, Fly Armor can protect from 1 ½ feet (at around 70ºF) to 6 or 7 feet (at 90-100ºF) and will last up to four weeks of continuous use. You can also store the bands in the resealable packaging when you are not using it to increase its longevity. I love using this while trail riding or attaching it to my horse’s halter for turn-out. If you are thinking of trying an all-natural fly spray, Absorbine’s UltraShield Green fly repellent is one of the best we have to choose from. Unlike most natural fly sprays, which only contain citronella and cedar oil, UltraShield Green has an entire collection of natural oils that repel insects including clove oil. The clove oil adds a whole new level of incredible protection to this fly spray. It’s been proven to last for up to 8 hours and is even safe to use on your dog! For anyone who has ever felt a natural fly spray just wasn’t strong enough, try the UltraShield Green. It will change your life. Truly. Those folks at Absorbine have also released a new flyspray: UltraShield Sport (look for the Smurf-blue bottle). UltraShield Sport is sweat-resistant and super long lasting. Use this baby on the hottest, stickiest, most humid of days. It will NOT let you down. UltraShield Sport is not greasy or oily, either. So turn up the heat and throw some dust at me. With Ultrashield Sport in hand, I can take it! Damage already done? My favorite product for bites (and other kinds of wounds) is Farnam’s TRI-Care Ointment. TRI-Care Ointment helps protect against infection and provides a barrier against germs and flies. It also contains a pain reliever to ease pain and irritation on tender, sensitive skin. This is my go-to product when it comes to summer itch under my horse’s belly. So whether you’re riding at the break of dawn, at high-noon, or watching the sun set into that western horizon, Mary’s has the spray to keep those flies at bay! ← Win $100 to Mary’s Tack and Feed!